2016 Junior Top Guns 2nd place overall. It’s fun and i like seeing all my friends from all over Victoria. My favourite race to date would have been in 2015 racing the VCS, it was in Portland where I was running second for the majority of the race and managed to get a great run onto the straight to win by just 0.009 of a second, such a great feeling. My best season so far was 2014, we came out on top of the Vic Country Series and won many other titles including the North West Titles, the SA Festival State Cup series and managed to win most of SA’s Club events. Karting to me is everything, I love everything about it. Karting Brings you into an emotional roller-coaster and teaches you so many lessons in life. Karting is full of blood pumping, adrenaline rushing moments and the thrill of it all is unbeatable. Its a great family sport. Great friends, love the travelling. 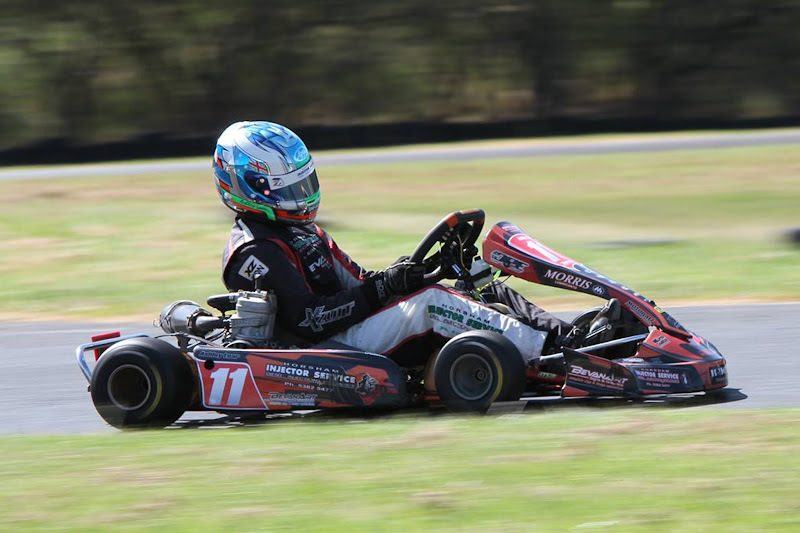 I have learnt to not give up and I enjoy working on my kart and trying to understand the mechanical side of things. The ability to drive side by side with other competitors is awesome and have respect and trust for everyone. I finished 2nd in the 2015 Victorian Country Series in the Cadet 12 class and 3rd in the SA State Series. I love karting because it is an adrenaline rush and I love motorsport in general. Won my first VCS round on the last lap of the day at my home track of Ballarat after being ready to settle for 3rd 3 laps before. I enjoy the challenge of motorsport and the community As an amateur photographer, its gratifying seeing my photos used and shared after a race weekend. I love karting because it’s a good way to interact and get to know people, on the other hand it’s great fun and gets the adrenaline pumping. 2014 Vic Closed State Champion (Cobden) OR Hamilton Club day many years ago on a wet day, on slicks in my clubman, pirouetted several times exiting the esses and ended up bogged on the infield near the tyre bundle. Kept the (clutchless) kart going, and rocked it until i rejoined after losing 2 laps sitting there. That clubman pulled 17500rpm, finished the race and left me with a smile! Karting has consumed me since I was 12 years old, It has given me some lifelong friends and some great memories. 2016 will be my final year in karting, who knows what life’s like without it?? 2013 Victorian Open at Puckapunyal, X30 Light, Working my way up the field getting as high as 3rd in the final, ultimately finishing 4th after qualifying a lowly 16th at the start of the weekend. 2015, 1st Vic Country Series, 1st Australasian Titles, Pole Position Rnd 4 State Series Puckapunyal. Bathurst, how could it not be! The feeling of driving on the limit and all the great mates you make along the way.